Welcome Stampers! I'm so happy you're visiting my blog! 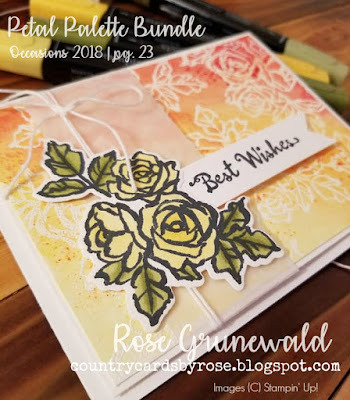 I've got some inspiration for you today with my entry to this week's Global Design Project challenge, and it's also a SNEAK PEEK of some super cool products from the new Occasions Catalog that goes live January 2. This week's Global Design Project theme is a sketch challenge. The sketch below is the inspiration for my card. I just love playing along with these challenges! They help get my creativity flowing - especially when I am using new product. 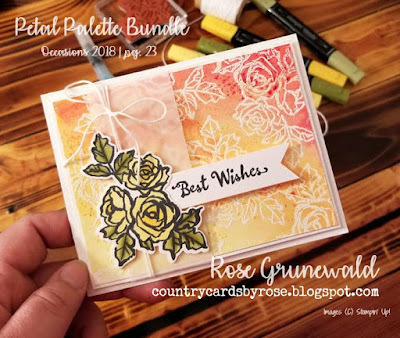 For my card, I decided to play around with my NEW Petal Palette Bundle from the 2018 Occasions Catalog. If you have your Occasions catalog handy, you can check it out on page 23. This card was a lot of fun to create. I got to do some coloring with my Stampin' Blends markers, which I swear makes me look like a professional - don't you think? It is so incredibly easy to get your shading just perfect with these markers. They are alcohol based, so blending is a cinch! I can't get enough of them! I used Vellum as the vertical layer and wrapped some white bakers twine around twice then tied in a bow to add just the perfect touch. So how do you like that transitional background and the new products? I'd love for you to leave me a comment and tell me what you think! You would really make my day! when you place any order under $150, and you will receive happy mail with a special thank you gift from me! You can shop in your pjs if you want - just click any of the products below and you'll go right to my store.